At last ... 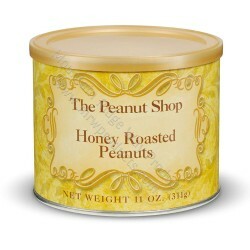 The Peanut Shop has perfected the Honey Roasted Peanut. Made with only the finest Virginia peanuts, each batch is perfectly coated with pure honey and a dash of salt. Honey Roasted Peanuts that is sure to become a favorite of yours! 11 oz.